Následující tabulka obsahuje padesátku nejúspěšnějších dyXoftích laděných autíček. Kromě obrázku jsou uvedena základní data a statistiky z jednotlivých disciplin dyXoftího halového mistrovství (aktuální pořadí, počet bodů a titulů z jednotlivých finálových startů a historicky nejlepší dosažená pozice). Protože dyXoft usiluje o maximálně vyrovnané souboje hráče s počítačem, je většina autíček laděna tak, aby s nimi počítač dokázal hráči úspěšně konkurovat (tato autíčka jsou označena jako "CPU"); pro hráče je určeno pouze několik autíček (s označením "player"), jejichž výkon je záměrně snížen. Below you can see the top 50 of dyXoft tuned ReVolt cars and read some info about them. The last column contains some race stats - current ranking, points/wins acquired in whole indoor championship and in final races on basic three types of track and the best result in all dyXoft Indoor Cup history. Because dyXoft strives for equal chances for computer and human player, the bulk of presented cars is tuned like computer-controled (CPU). On the other side, cars for player are underpowered and the player needs to be very intend and conscientious to win the fight. To install selected car into your ReVolt to get a real and hard opponent, you only need to download zipped car folder, then place a subdirectory with the same name as ZIP file into your REVOLT/CARS directory and save extract files into this subdir. In case of car display problems, delete .BMQ file. (AMW class * CPU) rank: 1. (Toyeca class * CPU) rank: 2. (R6 class * player) rank: 3. (Sugo class * player) rank: 4. (Volken class * CPU) rank: 5. (Sugo class * CPU) rank: 6. (Toyeca class * CPU) rank: 7. (AMW class * CPU) rank: 8. (Aqua class * CPU) rank: 9. (Sugo class * CPU) rank: 10. (Sugo class * CPU) rank: 11. (Sugo class * CPU) rank: 12. (Sugo class * CPU) rank: 13. (Sugo class * CPU) rank: 14. (Sprinter class * both) rank: 15. (Toyeca class * CPU) rank: 16. (Sugo class * CPU) rank: 17. (Toyeca class * CPU) rank: 18. (Cougar class * CPU) rank: 19. (R6 class * player) rank: 21. (Toyeca class * CPU) rank: 22. (Sugo class * CPU) rank: 23. (Sugo class * CPU) rank: 24. (Cougar class * CPU) rank: 25. (Toyeca class * CPU) rank: 26. (Sugo class * CPU) rank: 27. (R6 class * player) rank: 28. (Toyeca class * CPU) rank: 29. (Sugo class * CPU) rank: 30. (Sugo class * CPU) rank: 31. (Sugo class * CPU) rank: 32. (Volken class * CPU) rank: 33. (R6 class * player) rank: 34. (Volken class * CPU) rank: 35. (Cougar class * CPU) rank: 36. (Aqua class * CPU) rank: 37. (Sugo class * CPU) rank: 38. (Sprinter class * CPU) rank: 39. (Sprinter class * CPU) rank: 40. (Adeon class * CPU) rank: 41. (Aqua class * CPU) rank: 42. (Sprinter class * CPU) rank: 43. (Cougar class * CPU) rank: 44. (Adeon class * CPU) rank: 45. (Grudge class * CPU) rank: 46. (grudge class * CPU) rank: 47. (Pest class * CPU) rank: 48. (Pest class * CPU) rank: 49. (NY54 class * CPU) rank: 50. (NY54 class * CPU) rank: 51. (Zipper class * CPU) rank: 52. (AMW class * CPU) rank: 53. Následující tabulka obsahuje dvacet pět tratí pro dyXoftí halové mistrovství, jejich základní data a statistiky (typ, délka, nejlepší dosažený čas na závod o délce 5 kol a jeho držitel). Tratě jsou optimalizovány pro autíčka řízená počítačem a průběžně dolaďovány. Chcete-li si některou z tratí nainstalovat, stáhněte si přiložený ZIP soubor, vytvořte v adresáři REVOLT/LEVELS podadresář se stejným jménem a rozbalte do něj komprimované soubory. Chcete-li, aby se v nabídce tratí zobrazovaly ilustrační obrázky, rozbalte tento soubor do adresáře REVOLT/GFX. Below you can see some info about 25 dyXoft ReVolt indoor tracks - track type, length, best race (5 lap) time and best race time bearer. 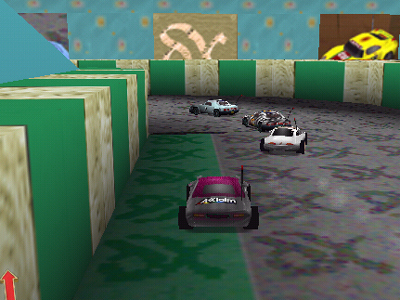 All tracks are optimized for CPU controlled cars and fine-tuned continuously. To install selected track into your ReVolt game, you only need to download zipped track folder, then place a subdirectory with the same name as ZIP file into your REVOLT/LEVELS directory and save extract files into this subdir. To install intro pictures, download and extract this file into REVOLT/GFX subdir. Grand Prix tracks are 600-700 metres long with maximum race time not exceed 5 minutes. Long straights, flat and gradual curves. No steeps, humps nor hard jumps. Cross tracks are 300-500 metres long. Sharp and slanting curves, very short straights, banks, hard steeps, humps, dips, rumble strips. eXtreme tracks (except Indy) are 700-1250 metres long with race time not exceed 10 minutes. Contain all possible elements include pipes and chicanes. Indy Ring is something special - simple ring where any car can reach its top speed.